It was the second year that XL Video has supplied the event. 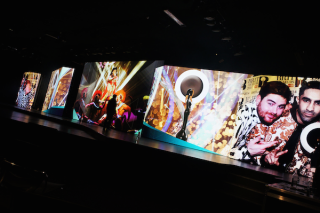 XL Manager Guy Vellacott and his team worked alongside brand experience agency Flourish Creative’s Director Guy Tremlett and Technical Production Manager Mark Brattle to create a streamlined video-orientated set environment to suit the vibe of the event. The total screen area across the stage end to end was 28 metres at around 5 metres high. The total screen space was 28 metres at 5 metres high. The camera package included four Sony HXC-100 HD operated units plus a Bradley CamBall 3 positioned on one of the over-stage trusses specifically to capture Jamie Oliver’s onstage demo from above. A GoPro ‘Pan-cam’ was also attached to his main saucepan, which produced some eclectic and interesting shots for the mix. Building the four double-sided revolving screens provided the biggest physical challenge for XL’s crew. The front side was populated with MC-7T first, and then the reverse side of F-12 screen added, and then both sides had to be simultaneously cabled by the crew – some of XL’s fittest – squeezed inside the frames between the two surfaces. Additionally challenging was the complexity of the playback content, with the fact it came from multiple sources. The high pressure timescale for editing and tweaking onsite before the event went live required an fast operation which XL provided.